Pipes and fittings are used for a wide range of applications for both underground and aboveground installations, including crude oil conveyance, flow lines, fire water lines, potable water lines, seawater cooling systems, industrial waste and marine and offshore applications. Our pipes and fittings diameter range ranges from 25 mm to 1600 mm. Pressure classes are available up to 50 barg. and the maximum design temperature is 110ºC. Pipe systems are designed and qualified according to the major international standards, such as ASTM, DEP Shell, UKOOA, AWWA and ISO. 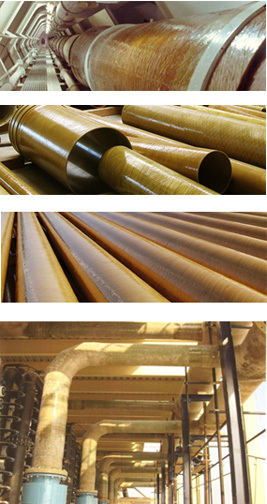 Pipe systems and fittings are manufactured by winding glass fibers and epoxy resin onto a smooth, rotating mandrel. The resulting pipes and fittings possess a high chemical resistance and excellent mechanical properties.